This great Cherokee Indian gave his people a gift that will endure forever. He gave them a writing system - so that the greatness of the Cherokee Nation will live forever. 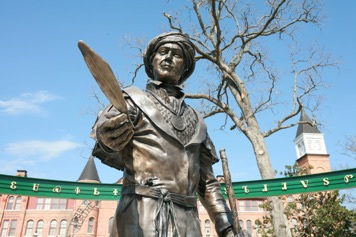 Sequoyah was born in 1776 at the village of Tuskeegee, which is in the state of Tennessee. His father was Nathaniel Gist, a Virginia fur trader. His mother was Wut-teh, daughter of a Cherokee Chief. Sequoyah married a Cherokee, had a family and was a silversmith by trade. Sequoyah and other Cherokees enlisted on the side of United States under General Andrew Jackson to fight the British Troops and the Creek Indians in the war of 1812. Although Sequoyah was exposed to the concept of writing early in his life, he never learned the English alphabet. He began to toy with the idea of a Cherokee writing system in 1809. During the war, he became convinced of the necessity of literacy for the Cherokee people. Unlike the white soldiers, he and the other Cherokees were not able to write letters home, read military orders, or record events as they occurred. After the war, he began in earnest to create a writing system for the Cherokees. When he returned home after the war, he began to make the symbols that could make the words. He finally reduced the thousands of Cherokee thoughts to 85 symbols representing sounds. He made a game of this new writing system and taught his little girl Akoya how to make the symbols. In 1821, after 12 years working on the new language, he and his daughter introduced his syllabary to the Cherokee people. Within a few months thousands of Cherokees became literate. Never before or since, has one man, not literate in any language, perfected a system for reading and writing a language. By 1825 much of the Bible and numerous hymns had been translated into Cherokee. By 1828 they were publishing the “Cherokee Phoenix”, the first national bilingual newspaper, along with religious pamphlets, educational materials and legal documents. In recognition of his contributions, the Cherokee Nation awarded Sequoyah a silver medal struck in his honor and a lifetime literary pension. He continued to serve the Cherokee people as a statesman and a diplomat until his death. In 1847, Austrian Botanist Stephen Endlicher named the great redwood, Sequoia (the Latin form of Sequoyah) after Sequoyah. For Sequoians, Sequoyah is a symbol of learning, wisdom, perseverance and self-reliance.